Synonyms: Bulgaria sarcoides (Jacq.) Dicks; Pirobasidium sarcoides (Jacq.) Höhn. Anamorph: Coryne sarcoides (Jacq.) Tul. & C. Tul. Fruiting body sessile to substipitate; at first subglobose, discoid, to club-shaped, the apex rounded, flattened to slightly concave, often fused into knobby, cerebriform to fan-shaped clusters; at maturity 0.5-1.0 cm becoming repand, centrally depressed, the margin lobed to wavy; surface glabrous to indistinctly roughened; context gelatinous, pinkish-purple; odor and taste mild. Ascospores 11.5-17.0 x 3.5-5.0 µm, narrowly ellipsoid to subfusoid, smooth, hyaline, with two droplets, in age usually one-septate, some germinating in the ascus; anamorph producing narrowly ellipsoid to allantoid-shaped conidia spores 3.0-3.5 x 1.0-2.0 microns, hyaline, smooth. 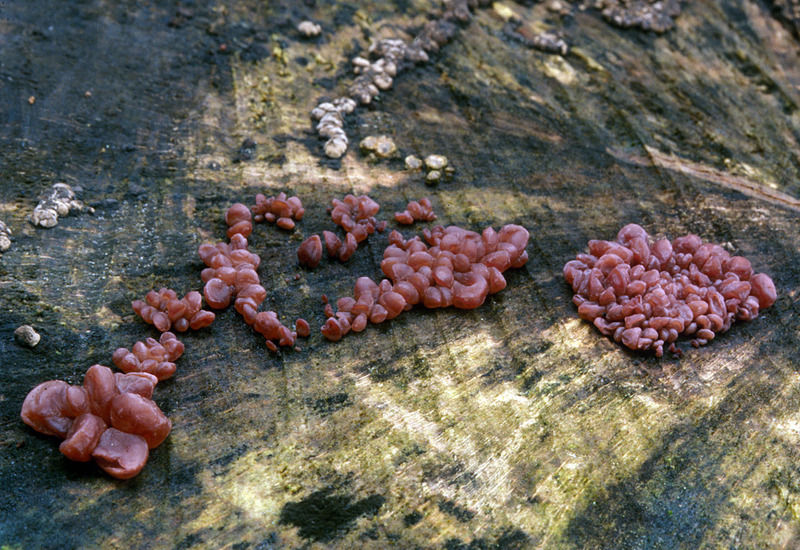 Gregarious to clustered on downed hardwood logs, cut stumps, occasionally on conifer wood; known from coastal forests, presumably present in the foothills of the Sierra Nevada; fruiting throughout the mushroom season; occasional, sometimes mistaken for a jelly fungus (see Comments). 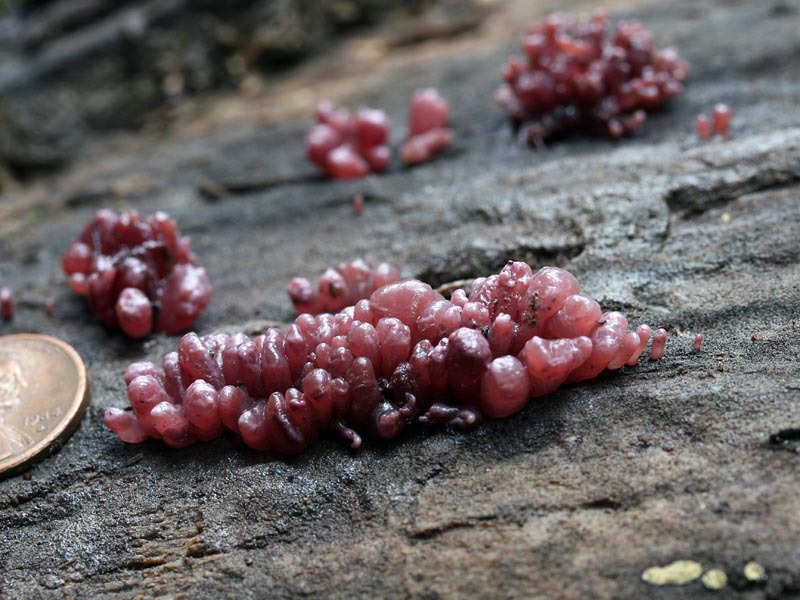 This pinkish-purple, gelatinous Ascomycete resembles a jelly fungus, and although unrelated, is sometimes confused with Tremella foliacea and Auricularia auricula. Tremella foliacea differs in its larger size, brown color, and leafy form, while Auricularia auricula, also larger and usually brown, is discoid to ear-shaped, with a ribbed undersurface. Microscopically, Tremella foliacea and Auricularia auricula are easily distinguished by their differing types of basidia rather than asci. Ascocoryne sarcoides occurs in two forms. An anamorph stage is known as Coryne sarcoides, producing asexual, i.e. conidia spores, and a sexual stage producing ascospores. From limited study it appears that the anamorphic stage occurs early in development as fused clubbed to cerebriform masses, while the sexual stage occurs at maturity as the fruiting body becomes repand. Breitenbach, J. & Kränzlin, F. (1984). Fungi of Switzerland. Volume 1: Ascomycetes. Verlag Mykologia: Luzern, Switzerland. 310 p.
Dennis, R.W.G. (1981). British Ascomycetes. J. Cramer: Vaduz, Liechtenstein. 585 p.
Seaver, F.J. (1978). The North American Cup-Fungi (Inoperculates). Lubrecht & Cramer: Monticello, N.Y. 428 p.